Этот плагин позволяет пользователям иметь стены, как на Facebook. Это большой инструмент, который делает ваш сайт более интерактивным, ваши пользователи имеют одну точку доступа, чтобы получать новости и сообщения, обмениваться ссылками, загружать фотографии, музыку и видео.Плагин действительно мощный, удобный и полностью на AJAX. This plugin allows your users to have Wall like on Facebook. 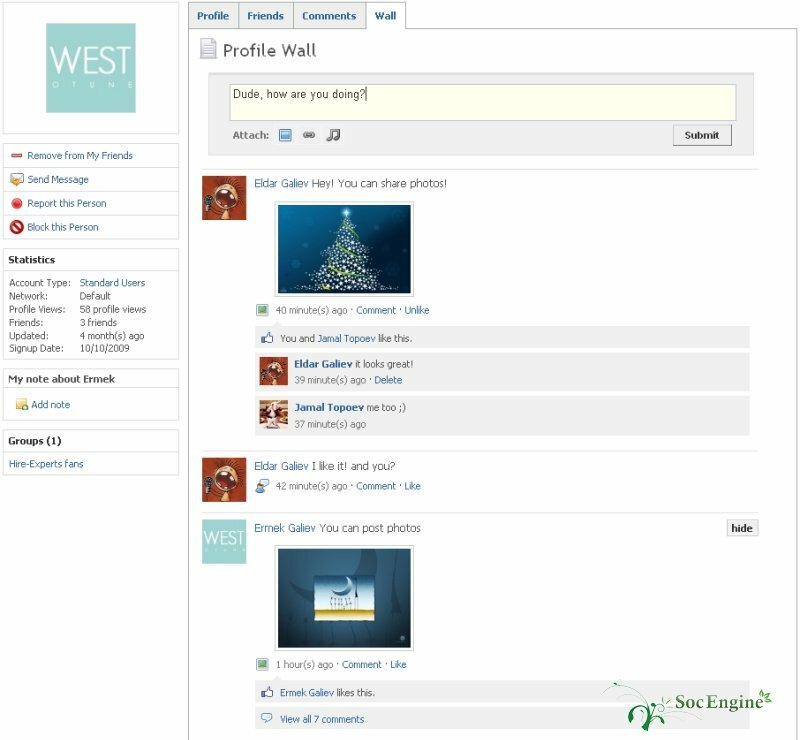 It is a great tool which makes your site more interactive, your users have one point access to news feed and tools to post messages, share links, upload photos and music. Our team has made a great effort to create really powerful, user-friendly and fully ajax feature. * Nice interface. Ajax based user-friendly interface. Everything is loaded via ajax: comments, "Likes", photo/music/links uploads! * What's on your mind? Users can post messages to Wall so anyone can read and comment. * Share links! It is much easier just to send links(funny video, useful article, etc) to Wall and anyone can comment and commend("like") it! * Share Photos! 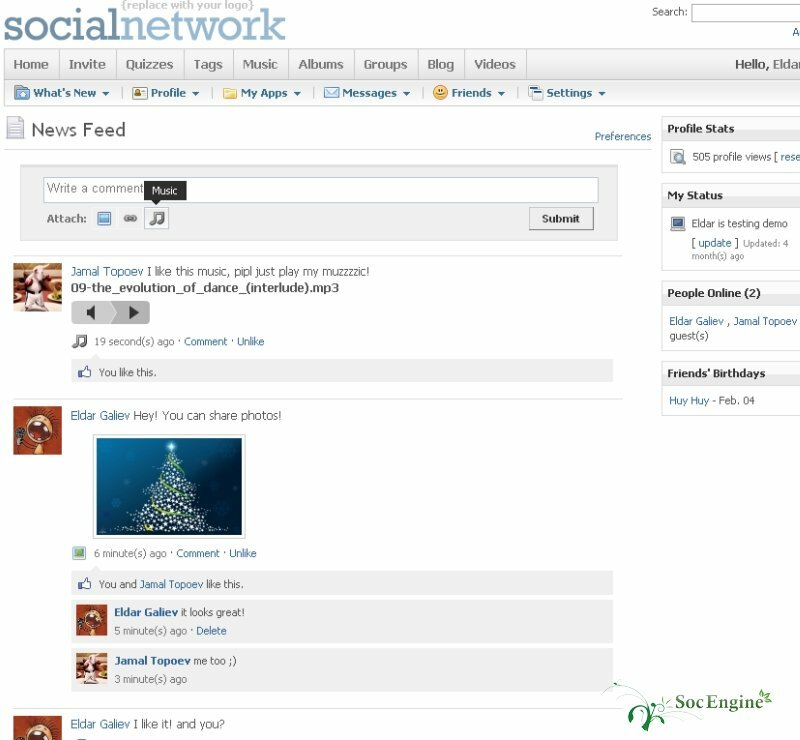 Your users can share own photos so all friends can see and comment it. These photos can be viewed on Wall as a nice thumbnail and on a separate page in full size. * Share Music! Your users can share music with friends, play via nice music player and all these things don't require any page reloads! * Informative activity feed. Out of sight the modest icons from actions! Now you can see action owner thumbnail on each action. * Hide action. If I don't want to read this newsfeed action, I won't! Let me hide it! * Share Videos! Your users can share YouTube and Vimeo videos, play them via flash player and all these things don't require any page reloads! * Wall synchronization with Plugins. 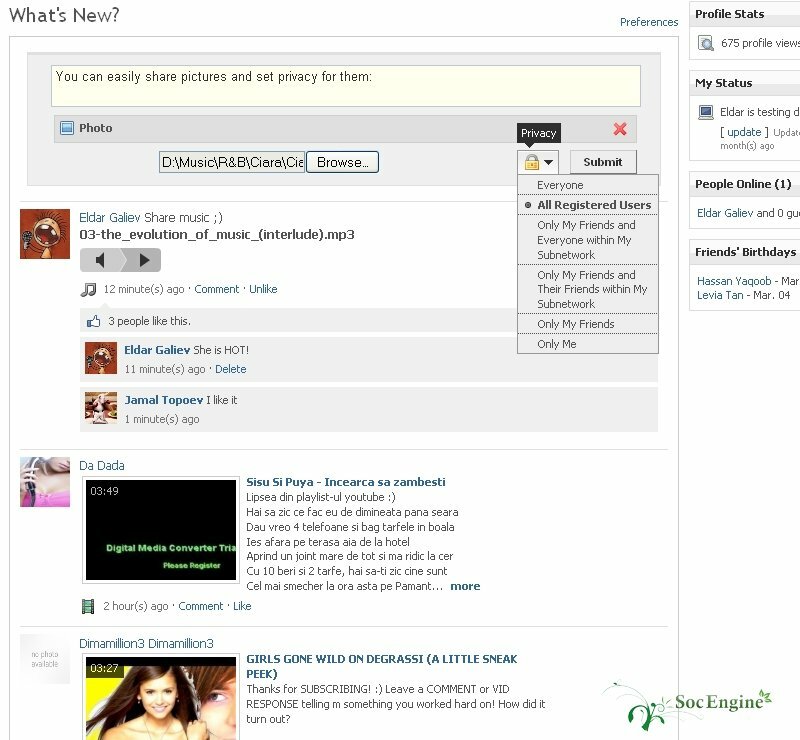 It is one of most requested feature and we're glad to present you flexible bridge between Wall and Photo Albums, Music, Video plugins(from SocialEngine). So all posted photos, music, videos are saved in appropriate plugin but Wall doesn't require them so users can share content even if you don't have these plugins. * Wall integrated into Groups plugin! Now each group has own wall so group members can share and have fun within a group. Also all posted photos are added into Group Photo Album.